The value of a jewelry piece is determined by the prestige of the jewelry house - its history and traditions, its associations with the beau monde and the global elite. Young Russian brands have no such advantage; they have to win acclaim by dint of their novelty and craftsmanship alone. RBTH introduces you to five Russian jewelers capable of gaining international recognition and takes a look at their work. A designer with a theological education, Pyotr Aksyonov started out as a painter, who, although a favorite of the Moscow social set, never received the acclaim of the critics. Several years ago, he switched found his vocation in jewelry making and has not looked back since - his new creations were a raging success with glossy magazines and among it-girls. A signature feature of the designer’s Axenoff Jewellery brand is historicism, i.e. 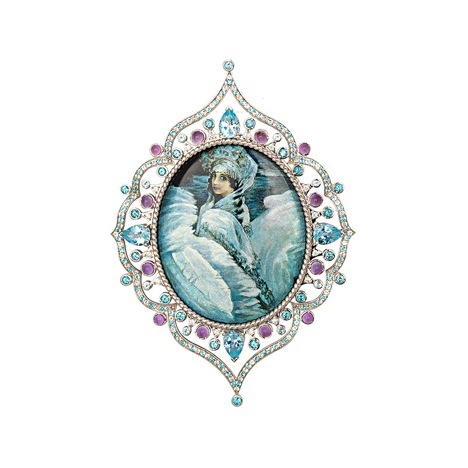 the Russian jewelry tradition of the 16th-19th centuries and the symbols of culture: the luxury of tsars’ chambers and of icon casings, the murals of the Kremlin’s halls, folklore, opera, ballet and paintings. The earrings, the rings, the brooches, the necklaces and the tiaras are crafted not only with expensive materials – platinum, diamonds, sapphires and emeralds – but also using cheaper materials such as silver and semi-precious stones. They transferred the basic laws of harmony and structure onto jewelry, then hooked on modern technology, the latest design trends and history of symbols in different cultures. The distinctive features of the brand are blunt shapes of gold and silver pieces, the patina, blackening, enamels, and the naturalness of rough stones. Each piece is hand-made, so with Alchemia no two rings are identical. Anyone can participate in the creative process together with the master and create a unique piece of jewelry. In 2014, the team opened a shop in the trendy Soho district in Hong Kong. Markin's mechanical creations are at the meeting point of engineering, physics and industrial architecture, but do not lack irony and are created with respect to all traditions of working with precious metals and stones. The philosophy and the style of Gourji are inextricably linked to Russian history. In addition to jewelry, the brand produces collections of cufflinks, pens, shawls and scarves for upscale clients. All the accessories of the brand refer to various historical periods, religions and cultures of Russia. Yana Raskovalova has traveled a long way: From a model, a businessman's wife and a Russian it-girl, she became the head of a jewelry house. Having the fortune to gaze at jewelry masterpieces not through the shop windows but in her own jewelry box, Raskovalova got herself a hobby: to hunt for antique cameos all over the world and to decorate them with jewels according to her own taste. Thanks to the financial support of Raskovalova's husband Vadim, the passion turned into big business: The jewelry is now sold in outlets belonging to the Podium Jewellery chain, in Paris, Monte Carlo, Courchevel and Dubai. Meanwhile, Raskovalova’s socialite girlfriends, from fashion designer Ulyana Sergeenko to Russian model Natalya Vodianova, have become the brand’s messengers.